HashCalc 2.02 is other software developed by SlavaSoft Inc..
Free, fast calculator to compute hash, checksum, HMAC values for file, text and hex string. 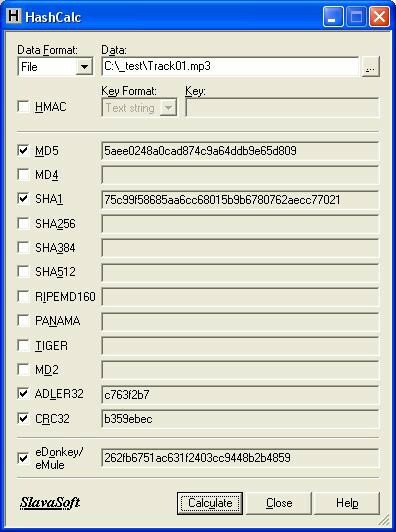 Supports popular message digest and check sum algorithms: MD2,MD4,MD5, SHA1,SHA2, RIPEMD160,PANAMA,TIGER, CRC32,ADLER32, and the hash used in eMule/eDonkey (eDonkey2000,ed2k). With this tool you can test for corruption FTP download/upload transfers, compare music,audio,video,game,image files, verify a CD, perform checking of mp3,mpeg,vcd,iso,zip downloads. This development program is freeware, so you can download and use it absolutely free. HashCalc 2.02 supports English interface languages and works with Windows 98/XP/Vista. Latest HashCalc 2.02 does not contain any spyware and/or advertise modules, allowing installing it with no worries concerning valuable information loss. Our website has thoroughly tested development product HashCalc 2.02, written the review and uploaded installation file (468K) to our fast server. Downloading HashCalc 2.02 will take several seconds if you use fast ADSL connection.